“Heil Victory!” Alt-Right Groups Emboldened by Trump’s Election & Chief Strategist Steve Bannon | Democracy Now! Dorot professor of Holocaust studies at Emory University. The film Denial, based on the court case in which she was sued by a leading Holocaust denier, is currently in theaters. A video leaked Monday from a self-proclaimed “alt-right” conference that took place over the weekend in Washington, D.C., shows hundreds gathering to celebrate Donald Trump’s victory and raising their arms in the traditional Nazi salute and saying “Heil victory!” Leaders of the alt-right movement have been emboldened since Trump’s election, particularly since he named Steve Bannon to become his chief strategist after first being his campaign manager. Bannon is the former head of the right-wing news outlet Breitbart Media. We speak with Deborah Lipstadt, Dorot professor of Holocaust studies at Emory University, who says Bannon’s appointment is “the most depressing of almost anything I’ve heard thus far.” Lipstadt is also the subject of a feature film now in theaters called “Denial,” which is based on a court case in which she was sued by a leading Holocaust denier. JUAN GONZÁLEZ: We begin today with a look at the growing movement in the United States that calls itself the alt-right. On Monday, a video was leaked from an alt-right conference that took place over the weekend in Washington, D.C., where hundreds gathered to celebrate Donald Trump’s victory. In the video, alt-right leader Richard Spencer recites Nazi propaganda in original German, as some attendees raise their arms in the traditional Nazi salute. RICHARD SPENCER: Heil Trump! Heil our people! Heil victory! To be white is to be a striver, a crusader, an explorer and a conqueror. We build. We produce. We go upward. And we recognize the central lie of American race relations. We don’t exploit other groups. We—we don’t gain anything from their presence. They need us, and not the other way around. America was, until this past generation, a white country, designed for ourselves and our posterity. It is our creation, it is our inheritance, and it belongs to us. JUAN GONZÁLEZ: That’s alt-right leader Richard Spencer speaking over the weekend. When asked by The New York Times about Donald Trump, Spencer said, quote, “I do think we have a psychic connection, or you can say a deeper connection, with Donald Trump in a way that we simply do not have with most Republicans,” unquote. Leaders of the alt-right movement have been emboldened since Trump’s election, particularly since he named Steve Bannon to become his chief strategist after first being his campaign manager. Bannon is the former head of the right-wing news outlet, Breitbart Media. Well, for more, we’re joined by Deborah Lipstadt, the Dorot professor of Holocaust studies at Emory University. When asked about Bannon’s appointment, she told Politico, quote, “I find that the most depressing of almost anything I’ve heard thus far.” Lipstadt is also the subject of a feature film, now in theaters, called Denial, which is based on a court case in which she was sued by a leading Holocaust denier. Welcome to Democracy Now!, Professor Lipstadt. Professor Lipstadt, can you hear me? I think we’re having a little problem with the connection with Professor Lipstadt. We’ll take a break and come back. JUAN GONZÁLEZ: “Can’t Go Home” by Weyes Blood. Welcome back to Democracy Now!, democracynow.org, The War and Peace Report. I’m Juan González. Deborah Lipstadt is the Dorot professor of Holocaust studies at Emory University. The film Denial, based on the court case in which she was sued by a leading Holocaust denier, is currently in theaters. She joins us now to discuss the growing alt-right movement. Welcome to Democracy Now!, Professor Lipstadt. DEBORAH LIPSTADT: Thank you very much. Thank you for having me. JUAN GONZÁLEZ: Well, tell us about your concerns, especially, first, about the appointment of Donald Trump of Steve Bannon as his chief strategist. JUAN GONZÁLEZ: —can see what you’re and hear what you’re talking about. This is that ad. DONALD TRUMP: The establishment has trillions of dollars at stake in this election. For those who control the levers of power in Washington and for the global special interests, they partner with these people that don’t have your good in mind. The political establishment that is trying to stop us is the same group responsible for our disastrous trade deals, massive illegal immigration, and economic and foreign policies that have bled our country dry. The political establishment has brought about the destruction of our factories and our jobs as they flee to Mexico, China and other countries all around the world. It’s a global power structure that is responsible for the economic decisions that have robbed our working class, stripped our country of its wealth and put that money into the pockets of a handful of large corporations and political entities. JUAN GONZÁLEZ: That was the ad, and it was an extended ad, not your normal 15-second or 30-second commercial. Your response to that ad, Professor Lipstadt? Well, we’re having problems with her again. But in response to the ad, Jonathan Greenblatt, the CEO of the Anti-Defamation League, tweeted, quote, “Whether intentional or not, the images and rhetoric in this ad touch on subjects that anti-Semites have used for ages. This needs to stop. In the final days before the election, tensions are extremely high. It’s a time when all candidates need to be especially responsible and bid for votes by offering sincere ideas and policy proposals, not by conjuring painful stereotypes and baseless conspiracy theories.” That was the Anti-Defamation League. Professor Lipstadt—we’re again having problems with the connection to Emory University, and we’d like to go to this other clip of Howard Dean, who is running for chair of the Democratic National Committee, a position he’s held previously. He spoke with Canada’s CTV about Donald Trump and his picks for his senior officials. HOWARD DEAN: He’s a complicated guy. He appoints a reasonable person, who’s much more conservative than I am, but somebody you can talk to, to his chief of staff. And then his senior adviser is a Nazi. I mean, what—you know, what do you do with this? EVAN SOLOMON: —who is the chairman of the Republican national party. EVAN SOLOMON: Right? He’s now his chief of staff. HOWARD DEAN: Right, which is a far-right, anti-Semitic publication. EVAN SOLOMON: You called him a Nazi? HOWARD DEAN: Well, he’s anti-Semitic, he’s anti-black, and he’s anti-women. 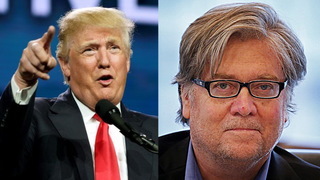 EVAN SOLOMON: He is Donald Trump’s chief strategist. What does that tell you? HOWARD DEAN: It makes me very nervous. JUAN GONZÁLEZ: That was Howard Dean being interviewed by [Evan Solomon] about Donald Trump’s picks. Unfortunately, we’re still having problems in connecting with Professor Lipstadt at Emory University, so we will have to return to her on another day, and we’re going to move—and we’re going to move on to our next segment.